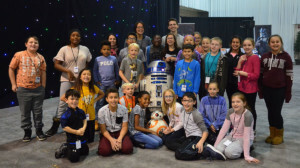 Wheatland-Chili Students in Pauline Emelson’s fourth-grade class and Geoffrey Carvill’s fifth-grade class joined 900 students from 36 school districts on a field trip to the first-ever Science Technology Engineering Art Math (STEAM) Fest held at the Rochester Riverside Convention Center as part of the Maker Faire. The students were able to participate in hands-on learning activities throughout the day. They made ice cream, tried on robotic arms, extracted banana DNA, learned the basics of soldering, how to grow vegetables, computer programming and how a 3D printer works. Impossible Science World magician Jason Latimer put on an engaging science filled show that wowed the crowd.Wheatland-Chili is a K-12 Project Lead the Way (PLTW) District which is pre-engineering coursework that engages students’ natural curiosity through problem-based learning. Fourth-grade teacher Pauline Emelson is the PLTW Coordinator for T. J. Connor Elementary School. Recently, the District showcased the work of PLTW students by inviting engineers, company representatives, and Monroe County leaders to visit Mrs. Emelson’s classroom for a demonstration of the PLTW learning modules.